Tech Review (TR 2018-12-08)--Domain Mondo's weekly review of tech investing news with commentary, analysis and opinion: Features • 1) Huawei CFO Arrested, 2) U.S. Oilfield Technology, 3) Investing: The Week, Notes, 4) ICYMI Tech News: Microsoft, Facebook, Alibaba, Tencent, Tumblr, Ninebot, Google. Fortune.com video above published Dec 6, 2018. Meng Wanzhou, CFO of Chinese telecom giant Huawei (and the daughter of the company's founder) was arrested earlier this week in Canada, is facing a series of fraud charges that could set the stage for her extradition to the U.S., a Canadian prosecutor has revealed. Financial Times (ft.com) video above published Dec 6, 2018: Canada has arrested Huawei’s CFO following a US extradition request, reigniting investor concerns over heightened tensions between Washington and Beijing days after Donald Trump and Xi Jinping tried to resolve their trade conflict at the G20 summit. Arrest shakes Huawei--Global Skepticism of Huawei's Business Grows--nytimes.com: "all around the globe, the walls are going up for Huawei ... a wider patch of the world appears to be siding with Washington against Chinese technology." Japan’s government halts use of Huawei and ZTE products out of security concerns. 6 reasons why Huawei gives the U.S. and its allies security concerns. The U.S. Just Became a Net Oil Exporter for the First Time in 75 Years | bloomberg.com Dec 6, 2018: Crude, refined products exports exceed imports in weekly data. Shale boom has boosted U.S. crude oil shipments to a new record. 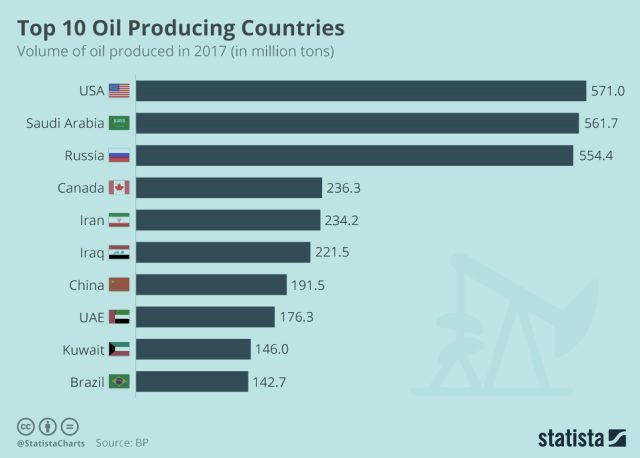 Large rivals in the race to grow U.S. shale production and profits, include BP ($BP), Exxon Mobil Corp ($XOM), Chevron, Royal Dutch Shell, and Norway’s Equinor. All are expanding drilling and acquisitions, particularly in the Permian Basin of West Texas and New Mexico, the largest U.S. oil field and the center of the shale revolution--How BP found shale profits with 'crystal ball' oilfield technology | reuters.com. Biggest Worry for Traders? They Don't Know Why Stocks Are Moving--bloomberg.com. Editor's note: the above quote is about as helpful as saying, "History shows that when a person is born, they will die." The data shows there is a considerable lag time from the time of the first 10/2 inversion to the point where a recession manifests itself, sometimes years (look at the chart above or here or here (e.g., 2006 inversion to 2008 recession). Apple $AAPL: if you had a 5 percent weighting of Apple in 1998 and invested the rest in SPY, $AAPL would have grown to close to 90 percent of your portfolio. If you owned a portfolio of individual stocks, Apple would be closer to 100 percent, as you'd inevitably have losers (two-thirds of individual stocks underperform the market).--SeekingAlpha.com. Brexit: May’s Brexit Deal Is a Betrayal of Britain, If the U.K. parliament supports her plan, it will never be forgiven.--opinion in bloomberg.com by Mervyn King, former governor of the Bank of England for a decade, beginning in 2003, now a professor at the New York University Stern School of Business. Next week the Brexit vote is scheduled for December 11, 2018: Editor's note: if you always wanted to invest in the UK or London-listed companies, or own some London real estate, there may be some real opportunities emerging. "Be fearful when others are greedy and greedy when others are fearful." --Warren Buffett. Microsoft $MSFT is building a Chromium-powered web browser that will replace Edge on Windows 10--windowscentral.com. Facebook $FB CEO Mark Zuckerberg, more ruthless than clueless?--bloomberg.com. Alibaba $BABA, Tencent, and more caught up in China's anti-graft crackdown--reuters.com. NSFW Tumblr (tumblr.com owned by Verizon $VZ) will permanently ban adult content from its blogging platform beginning December 17, 2018. China's Ninebot (ninebot.cn) makes almost all the world's scooters--bloomberg.com. Personal Tech: another failed Google $GOOG $GOOGL chat app experiment, this time Allo which will stop working March 2019.